Ted spent a couple of hours outside in the drizzly cold weather today; he got a hay bale for the cattle, brought a bag of pig feed up for the pigs, fed the chickens (again), slipped the pigs, and raked our driveway, Gramma Izzie’s driveway, and the church’s driveway with the tractor. He wanted a good dinner when he came in, but he wanted a fast dinner. Ta-da! 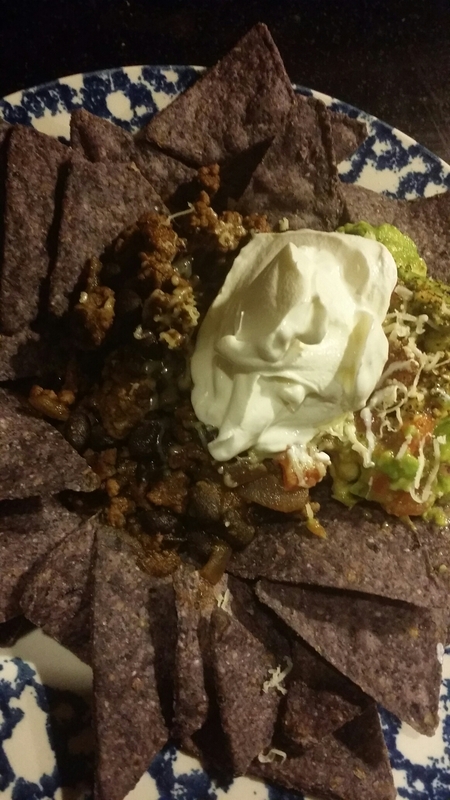 Homemade nacho meat from grass-fed beef and organic black beans served with homemade guacamole, gmo free Blue Tortilla Chips, sour cream, and hot pepper cheese…and it only took 20 minutes in the kitchen! Use a cast iron pan if you have it because it really does make a difference in taste! Brown the ground beef. Add the onion to the pan after about ten minutes (stir every few minutes so nothing sticks). Make sure the beef is cooked through. Add the drained black beans, half a can of water, and homemade taco seasoning. Stir well. Let that simmer on the lowest setting while you whip up the guacamole. Serve with organic blue corn tortilla chips, and use good sour cream and cheese from pasture-raised grass-fed cows to top it all!